Everest Poker is a very popular and great room. It has been around for a while, and unfortunately does not accept US players since the UIGEA passed in 2006. However, if you are located outside of the US, UK, France, Italy, and other prohibited jurisdictions, Everest may be the room for you. 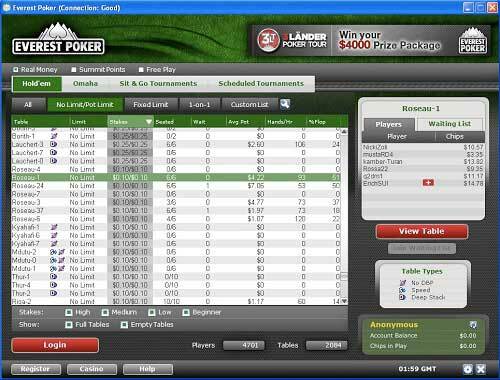 It used to operate an independent poker site but has since joined the iPoker Network. If you have played at this room for a while, or maybe if you haven’t, you might be missing out on something. 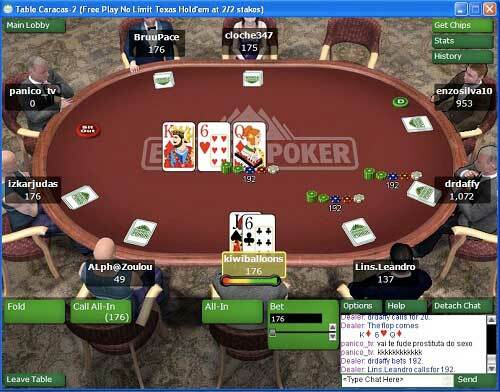 Everest Poker Rakeback is available, but most people do not know how to obtain it. While Everest Poker does NOT offer direct rakeback, they do offer a rakeback alternative which enables you to reap the same benefits! Everest Poker Rakeback is obtained through their VIP program, called VIP Rewards. Your level in the VIP Rewards scheme will depend upon the number of Summit Points (SPs) you can accrue during a single month. The details of each level are described below. VIP 1 (0 SPs required): Every player is placed in the first tier of the Everest VIP Rewards program by default. There are few rewards at this level. You’ll receive a number of Reward Points (RPs) equal to the number of Summit Points you earn. VIP 2 (75 SPs required): At this level, you’ll get a 10% bonus on your Summit Points, so earning 100 such points will grant you 110 Reward Points. VIP 3 (200 SPs required): The third VIP level will reward you with 1.2 Reward Points for every SP collected. VIP 4 (500 SPs required): Players who can make it to the fourth tier at Everest Poker will gain free access to the €5,000 Mighty Monthly tournament. Additionally, they’ll receive a rate of 1.35 Reward Points per Summit Point earned. VIP 5 (1,000 SPs required): At the fifth stage in the rewards scheme, players gain 1.45 Reward Points for each Summit Point gathered. They’ll also be entered into the €5,000 Mighty Monthly event. VIP 6 (2,000 SPs required): In this level, players are rewarded with 1.55 Reward Points for every 1 Summit Point they earn. A free €5,000 Mighty Monthly token is also granted to these players. VIP 7 (5,000 SPs required): Reach the VIP 7 tier and gain a 70% boost to your Reward Points. If you earn exactly 5,000 SPs in a month, you’ll receive 5,000 * 1.7 = 8,500 Reward Points. You will also get a free €5,000 Mighty Monthly tournament entry. VIP 8 (10,000 SPs required): At the eighth stage of the VIP Rewards program, players will get 1.80 Reward Points every time they earn a Summit Point as well as complimentary entry into the €5,000 Mighty Monthly tourney. VIP 9 (20,000 SPs required): Players who make it to VIP 9 get 1.90 Reward Points for every SP collected at the tables. Moreover, they’ll be able to play the €5,000 Mighty Monthly tournament for free. VIP 10 (50,000 SPs required): Everest caters to its highest-ranking players by issuing them 2.05 Reward Points every time they earn 1 Summit Point. Furthermore, they will be entered into the €5,000 Mighty Monthly event free of charge. Your position in the VIP program is determined by the number of Summit Points you can earn in a month. If you accumulate enough points in the middle of the month, your status will be upgraded on the same day! Furthermore, you’ll retain your status for the duration of the next calendar month. You’ll earn prorated points based upon rake taken and fees paid that are less than one currency unit, so even microstakes players will receive their fair share of Summit Points. These points will determine your position in the Everest Poker VIP Rewards program as detailed above. With each Summit Point you earn, you’ll get a certain number of Reward Points. The multiplier is based upon your rank in the VIP levels and is greater at higher tiers. The Reward Points are what you’ll trade in for rewards (hence their name) at Everest. There are some unique wrinkles to the way you can cash in your Reward Points at Everest, so keep reading to find out how to achieve the best possible Everest Poker rakeback equivalent. You’ll have to use your RPs within six months of earning them. Any points remaining after six months from the time they were collected will become expired. The interesting thing about these options is that the points/€1 ratio gets better and better with the larger reward exchanges. Thus players who can generate a lot of Summit Points gain the twofold boon of earning RPs more quickly as well as trading them in at a better rate. Please note that when electing to cash out your points for instant cash, as many points as possible will be used to grant you the largest possible cash value. This shouldn’t be a concern because the conversion rate only gets better as the amount of the payout increases. Nevertheless if you wish to exchange fewer points than the maximum, you can contact support to request a manual exchange. The VIP tournaments available at other poker sites often feel like tacked-on afterthoughts, usually amounting to a freeroll or two. Such is not the case at Everest Poker, where management has developed a full roster of VIP tourneys for players at every stage in the Everest Poker VIP Rewards plan. These regularly held tournaments are all multi-entry events wherein you may enter up to three times. There are usually several ways to gain entry into each tournament, and if you achieve more than one of them within the stated timeframe, you’ll get multiple entry tokens to use. What makes these events cool is that the entry conditions are often things that you would do anyway, such as depositing or generating a certain amount of rake, so you may find yourself earning tokens by accident. Whether you use them by accident or design, these free tournaments can really boost the bankroll of any poker player. Remember that you can earn an entry token for every single different way that you qualify for a given event. Stack up your tokens to maximize your chances by availing yourself of the multi-entry feature! Although there’s no Everest Poker rakeback in the traditional sense of the word, the rewards unlocked with the VIP Rewards program are essentially equivalent to rakeback. The smallest cash rewards pay out at a rate of 100 points per €1 awarded. Since you earn 10 points per euro of rake, this works out to €10 in rake or fees generated per euro granted, for a cashback percentage of 10%. This assumes that your VIP level is 1 and you therefore receive the base 1:1 RP multiplier. If you elect to take advantage of the tournament tokens conversion option, you automatically bump up this percentage to 11%. As you work your way up the ranks, better choices become available, and your multiplier will get higher and higher. At VIP level 5, with a multiplier of 1.45 and access to every VIP cashout option, you can up your rate of return. Assuming you can save up 4,000 Reward Points to purchase the €50 instant cash, you’ll be achieving a value-back rate of 18%. If you can keep grinding at VIP 5 over many months to earn the 13,500 points necessary for the €200 cash option, you’ll be receiving back 21% of the rake you’ve paid. At the peak of the VIP scheme, level 10, you’ll be able to get 2.05 Reward Points for every Summit Point you pick up. This, combined with the fact that the largest €5,000 reward will be within your reach, will mean that you can achieve a return of nearly 48%! This number doesn’t even incorporate the value of the free tourney entries that you’ll undoubtedly receive along the way.